Yay! Another week done 🙂 Midweek for me was a little ‘unproductive’ and involved me sitting on the sofa quite a lot in between working and dog walking! So most of my seven pictures this week are from my weekend, which is fine because Sunday Sevens doesn’t really have any rules…woohoo! 1. Apologies for the bad lighting and focus on this one but I had to get it quickly and quietly. 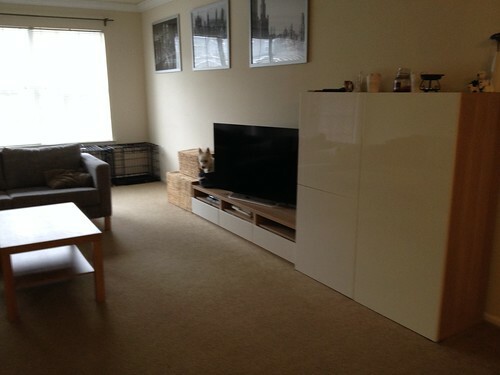 Can you spot the Westie? 2. 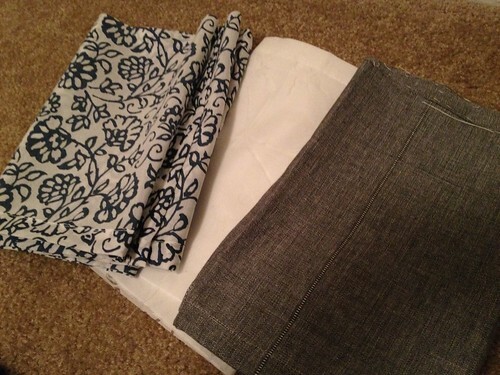 I did spend some time sewing as I altered 3 pairs of curtains. I needed to take 11 inches off each pair so I had quite a good bit of fabric leftover! The white is actually a floral transparent voile and I’m hoping to incorporate it into a top; maybe as a yoke?! 5. The dogs love going out for walks but recently I’ve been a little reluctant to go to the park/bay on my own as Buzz is barking A LOT when he is on his lead. However, I’m determined to keep taking him out in the hope that he will get used to seeing other people and dogs. Adam & I took the dogs to the bay this weekend and after a couple of laps Buzz had calmed down a lot, and even walked past other dogs without a sound! 🙂 They were both very happy dogs when we got back to the car. 6. We also visited our favourite lunch place – I had a gorgeous bacon cheeseburger on ciabatta bread. YUM! All the outside seats were taken so we sat in the solarium for the first time. It was very fancy! 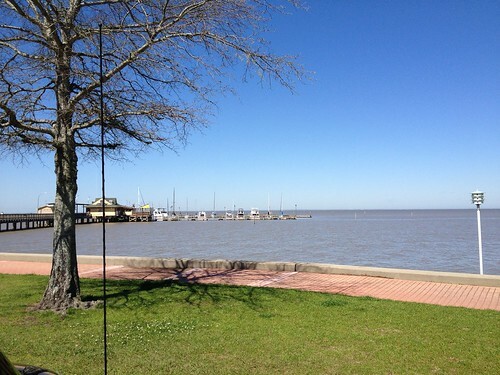 So glad you didn’t get any of those torrential downpours Louisiana has had. I’m still trying to get to a Target & search for a Cadbury bar so I can compare with the ‘real’ one Ali sent. Take care & have a grand week! Yes I’m happy that the warmer weather is on the way…still don’t like the humidity though! 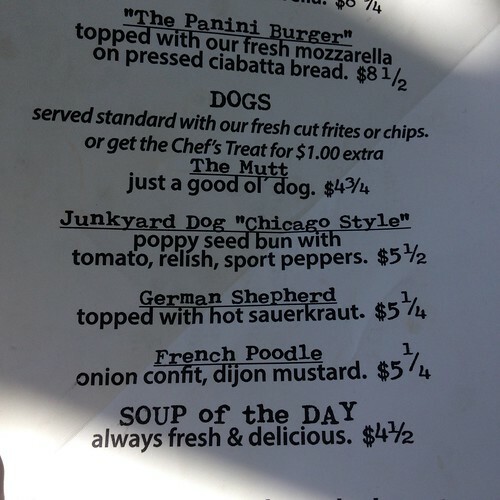 We have quite a few pet friendly restaurants with outdoor eating areas…I think quiet dogs are preferred though! Haha! I’m always surprised how quickly a day can pass just with a couple of dog walks as your main activity! Sounds like the 4 of you are all loving getting out and about in the sunshine 🌞 curtain alterations sound good – I look forward to seeing them up at the windows. That restaurant looks gorgeous – eating inside wasn’t too much of a hardship then?! Love the dog baskets in the car and, yes, just spotted one of them next to the TV! We’ve had clear blue skies here, too, but not the same temperatures – warm enough to leave the coat at home though. The solarium is a beautiful piece of architecture! Maisy has quietened down so much now…we are hoping Buzz gets quieter with age too! Haha! Looks like you had a productive week even if it didn’t feel like it to you. Hemming curtains can be quite the task. Your pups are so cute. Hiding behind the tv. Silly dog. My dog is the opposite of your’s. Mine barks way too much at home but, hardly makes a sound when we are away from home. I suppose it was a little more productive than I originally thought 🙂 I do think that doggy personalities are fascinating, especially the way their behaviour changes depending on surroundings! We used to have another dog who never barked at home but barked at other dogs when she was on leash. It’s definitely fascinating. Lovely week in photos. Dogs steal the show again! It does sound like a productive week! I love the productivity, but sitting-around time is pretty important, too. 😉 Glad you’re able to get out and enjoy the spring! Buzz and Maisy never fail to make me smile. Hopefully Buzz’s barking is just a pase where he’s found his voice and he’ll quickly grow out of it. Look forward to seeing what you make with the voile. 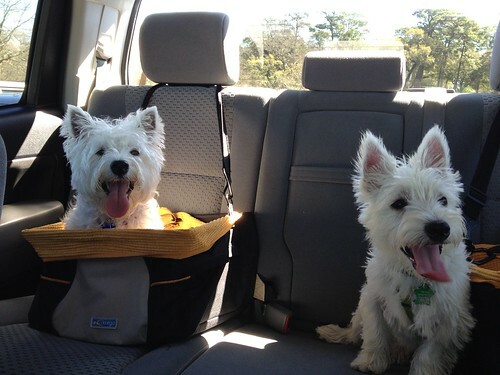 Oh those pups of yours….they just couldn’t be any cuter, sitting in the basket (well, one of them) in the car. Such perfect little angels, I can’t imagine Buzz being a barker. hehe. 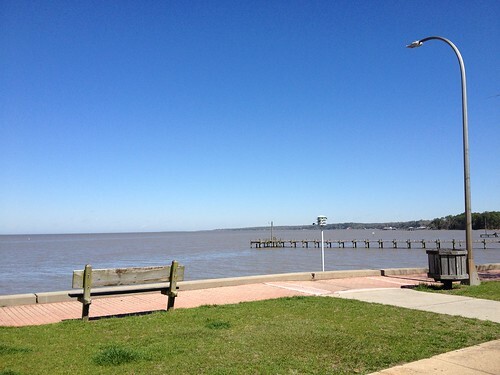 Nice week of photos, the bay is so inviting, and no big jacket necessary, wonderful! 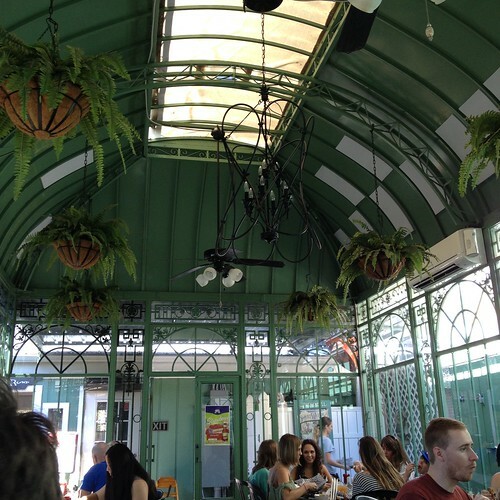 The solarium looks like a lovely spot for lunch.